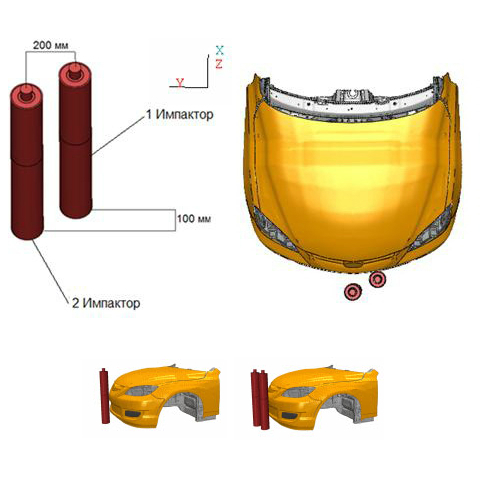 ANSYS ICEM CFD в проектировании гоночных машин. This figure shows the velocity vectors flowing through the radiator ducts. It is color coded by a normalized pressure (red compression, blue suction). This shows another form of oil flow visualization along the car's body. This shows a radiator streamlining color coded by normalized pressure. Shows the probable influence of the radiator flow on the rear-wing and hints at he need for these complex analyses. This shows the ICEM CFD surface mesh (triangles) and a slice of the volume mesh (tetrahedrons). A view of zero-mass particles as if released into the flowfield. Curlicues and spirals indicate areas of high turbulence. ICEM CFD Isosurface showing the magnitude of the vorticity vector. This isosurface is a constant-value surface and is used to graphically demonstrate the flowfield vortex features. Raven depiction of stress forces around the rear spoiler wing. Digital photo showing the engine of the Pratt & Miller - General Motors C5R Corvette from the 2002 racing season that impact fluid flows. The C5R is from the 2002 racing season. Underside of the Corvette C5R in CFD analysis with Aletheon's Raven solver. Blue lines are the numerical equivalent of an oil-flow visualization, i.e., a computer-generated path a drop of oil placed on the surface of the vehicle would follow. The surfaces are also color coded with blue areas representing suction and red representing compression. The inset, upper right-hand corner, is a plot of the pressure down the centerline of the vehicle. These values are used to compare with wind tunnel tests as a validation/verification exercise. This figure shows the detail of the ICEM CFD - RAVEN computation. All the relevant features have been adequately resolved including all of the exterior surfaces, rear suspension, rear oil cooler and accompanying ductwork, brake rotors, air-jacks, rear-suspension assembly, front suspension assembly, radiatorsimulation and inlet/exit ductwork for radiator, and brake cooling ducts. This CFD plot shows the streamlines (color coded by normalized pressure) flowing through the radiator. The flow was largely separated, thus indicating room for radiator efficiency improvements by re-shaping the inlet ducts. This image shows the surface mesh from ANSYS ICEM CFD used for the Raven solver calculations. There is a very high level of fidelity in this grid. It's not just how fast you go that makes winners in race car design, it's also how fast you go around the curves. In large part, that is a function of how much "downforce" is created by air flowing over the car's surfaces. Thus much of the computational fluid dynamics (CFD) analysis of race cars has to do with making sure the airflow pushes down on the car as it does with how smoothly the car slips through the air. Top-end speed is often limited by a particular racing series "sanctioning bodies." Their highly detailed rules are ultimately framed by a countervailing force of nature, the tolerance for risk in the insurance companies that underwrite race coverage. One of the leaders in racecar CFD is Aletheon Technologies LLC, since early 2002 a unit Pratt & Miller Engineering, New Hudson, Michigan. Pratt & Miller designs, develops, builds, races "all the way from a blank sheet of paper to the victory circle" for General Motors, Ford and DaimlerChrysler, among many others. Formerly known as BRD Motorsports, Aletheon is based in Mooresville, North Carolina. At Aletheon much of this work is done by Dr. David F. Robinson, an alumnus of the Department of Defense in-house programs in CFD and its technological first cousin, finite element analysis (FEA). A major benefit: Cutting down on high-cost physical testing in wind tunnels and on race tracks. Modeling for CFD and FEA really differ in just one major respect and that is CFD's need to model the layer of surface flow that is as thin as 0.000l inch. But with all the vortexes and friction, this flow is so complex-over 30 million points if an entire race car is modeled*-that solving it needs the equivalent of computing's race track, a supercomputer. "At the current state of development for CFD, the more points the better," Dr. Robinson observed. "Computationally speaking, what happens with each element effects all of its neighbors and, in fact, everything else in the model. Dr. Robinson has built his own supercomputer, nicknamed Hannibal. He also built his own solver, Raven CFD, soon to be marketed by Aletheon. ** This software was specifically designed to efficiently distribute and solve the CFD points, nearly 200,000 at a time, among his supercomputer's 210 CPUs. For the remainder of his CFD work-tedious and time-consuming gridding and pre-processing-Robinson relies on ICEM-CFD from ANSYS Inc., Canonsburg, Pennsylvania, USA (NASDAQ: ANSS). "The goal of our CFD analyses is not just reducing the drag, and hence improving the straight-away speed," Dr. Robinson pointed out. "In reality, we put most of our emphasis on improving downforce and making sure this downforce is balanced around the vehicle CG," or center of gravity. He emphasized that "distribution of both drag and downforce around the CG is often times as important, if not more so, than the magnitude of these values." "The aerodynamic performance envelope for any given race series is strictly controlled by that race's sanctioning body," he added. "We use ICEM to expand this envelope." "The main reason we model the entire car all at once instead of a single component at a time, is due to the coupled nature of the solution," he pointed out. "Since the flow is subsonic, information can propagate in all directions. This means changes in the rear-wing can, and do, have strong influence on the aerodynamics of the front of the vehicle. Therefore, you cannot do an analysis of the wing independent of the other components. "Software and hardware limitations makes this type of fully-coupled analysis infeasible for most race teams," he continued. "We do full-design iterations of the entire vehicle. Most racing outfits can manage at most a small number of full-scale CFD runs, often only one or two. At Aletheon, we will run in excess of a hundred full-scale CFD runs in 2003 alone." "For example," he said, "radiator air flows are modeled to make them more efficient and thus smaller. That affects the car's CG [center of gravity], which in turn affects cornering and overall handling. We can put the weight we saved in the radiator somewhere else closer to the CG." Modeling virtually every surface in a race car is what generates the enormous files. A rule of thumb in solving models of this complexity is that every million data points requires a gigabit of random access memory (RAM), also known as "core" memory, hence the supercomputer. In mid-2003, Aletheon upgraded that machine with 70 additional CPUs, Intel Corp.'s workhorse Xeon processors. "All this," he pointed out, "is to deal with a layer of air turbulence thinner one one-hundredth of an inch." Dr. Robinson estimates that Aletheon has about $250,000 invested so far in its Mooresville machine. "That's about a factor of fifty cheaper" than the multimillion-dollar proprietary Cray and SGI supercomputers he worked with in the Defense Dept. The peripheral machines are far less costly, too. For compatibility, the SGI supercomputers required using a several SGI workstations that cost $50,000 to $60,000 apiece. "Now we use Dells that cost $6,000 or $7,000." The raw speed of its tetrahedrons, "twice if not three times as fast as anything we had before to generate those meshes." Geometry tolerance, for ignoring gaps and overlaps. "ICEM is a top-down modeler, whereas the vast majority of the others are bottom-up," Dr. Robinson noted. "ICEM starts by putting a tetrahedral volume around the object you are modeling and then subdivides and re-subdivides the grid until you are done. If there is a hole or an overlap in the geometry, it will be ignored. Bottom-up models require trimming all surfaces together and then laying hundreds of thousands of tiny triangles over these surfaces and marching them outward. If there is a hole or an overlap in the geometry, it has to be fixed." That means going back to the CAD or solid modeler, then re-importing the repaired geometry. "I'd say this top-down approach is ninety-nine percent of the benefit in using ICEM." Handy shortcuts for starting a new model include shell or batch surface gridding. This handy short cut typically takes 20 minutes instead of 90 with a full-volumetric grid. "It's a good way to determine how many points will be needed to accurately represent a curved surface." Merging tetrahedrons to tetrahedrons. In its analyses, Aletheon often splits a car model into front, center and rear sections to speed up the full-car gridding process. "Tet to tet" gridding allows the model to be easily reassembled without having to continually perform redundant gridding on components that haven't been modified. The speed and power of ICEM also lets Aletheon build better models. "ICEM lets us model directly on the CAD data rather than rebuilding the geometry model in the pre-processor," Dr. Robinson said. "You get an accurate representation rather than an approximation. Human error is eliminated along with inaccurate interpolations for lofted curves. And ICEM helps use make sure we have all the right elements in all the right places." Aletheon builds geometry files from data supplied by customers, usually in Unigraphics or CATIA formats, and in-house modeling, usually in Rhino3D. These files are translated with IGES or STEP into SolidWorks and from there by direct translator into ICEM. "The direct translator for SolidWorks makes ICEM very easy to use," he said. The anticipated addition of a direct STEP translator in ICEM CFD Version 4.3 "will probably let us eliminate the SolidWorks intermediate step," he added. "With ICEM and the Raven solver, we can do a full suite of CFD runs-dozens of cases-for a racing program for $150,000 to $250,000," Dr. Robinson pointed out. "The people who buy and use supercomputers need annual budgets of $5 million to $20 million. That pretty much limits the market to the big money, Formula One racing teams and research labs runs by the federal government." In addition to savings in hardware costs, Aletheon Technologies has realized significant software cost savings by developing its own CFD solver, Raven. "One of the widely used commercial CFD solvers recently was quoted to us at a quarter of a millions dollars a year per user," he noted. At this level, it makes it difficult to be cost competitive with either track or wind tunnel testing. It prices CFD out of the reach of all but the most highly funded race teams. "Having our own in house solver does more than save us money up-front," he continued. "We also have complete control over the future development of the tool. We are specifically tuning the Raven code to improve performance for racing applications. For example, in addition to the racing applications, Aletheon Technologies has a number of contracts with the DOD. Specific capabilities were required for this work and having our own in-house code allows us to tailor the code for these unique needs." 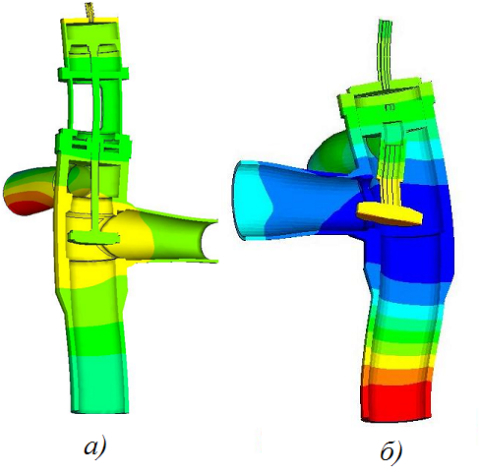 The ANSYS ICEM CFD organization has already written a direct translator for the Raven solver. The Raven software does not, of course, do everything that general-purpose commercial CFD solvers can do-combustion, multi-phase and particulates to name three big ones. But to Dr. Robinson, that is beside the point. "The commercial packages that supposedly do all the CFD analyses don't really do any of them very well," he said. "By specifically tuning our tool for a particular problem, efficiencies can obviously be obtained over existing solvers. We are staying away from the one-size fits all approach to code development, and focusing instead on a small niche in the market." In addition, Raven was designed from the ground up to be highly scalable. "We have found that it scales up better than linearly, one for one, in speed per additional processor. On 100 CPUs, it's more than 100 times faster than on a single processor. On 200 CPUs, it's more than 200 times faster. We tested it up to a thousand CPUs and performance stayed better than linear." In the computer hardware business, this is called "superlinear scalability," he pointed out. "Everyone strives for it. Not everyone gets it." Aletheon's analyses are used mainly to cut down on wind tunnel tests and building and testing prototypes. "Just to build a one-half scale model and all of the test parts needed for a year of wind tunnel tests might cost upwards of $500,000," said Dr. Robinson. "Rent for a wind tunnel for one day can be north of $20,000. On top of that you still need to bring in half a dozen test engineers" to set up, monitor and interpret the results. "Wind tunnel tests give you the total drag, the drag of the airflow over the entire vehicle and the total downforce," he noted. "This does not accurately simulate a race car's operating environment unless you also model the physics of the road rolling under the car. To do this, a 'rolling-road' wind tunnel must be used." In addition, to the global vehicle data provided by a wind-tunnel, CFD also provides the drag and downforce of every single component, even the left rear tail-light, if you need that information. "Each CFD run may take several days, but you get significantly more data from each run," Dr. Robinson pointed out. "The entire flowfield is captured and can be viewed using a post-processing tool. With wind-tunnel testing's global data results, this can't be done very effectively. Starting the design process using CFD lets Aletheon learn enough about the problem to put bounds around the amount of additional testing that will be required. "We use CFD to narrow our choices to only those that have the highest likelihood of improving the performance of the vehicle," he continued. "We choose maybe five to ten parts to test in the wind tunnel and optimize their design. After that, we might have just two or three things to test on the track with a prototype racer. Building a prototype car costs $400,000 to $600,000," Dr. Robinson noted. "Testing it means a lot of other costs" such as renting a track, expert personnel, travel, insurance, etc. "In the 'old' days with the Navy's Cray and SGI systems, a big aerospace problem would take three to six months to model and grid and two weeks to a month to solve," he recalled. "Even then we could only do individual components because the models were so big. In designing and engineering a racecar, breaking up a big model into components just won't work. Too many things affect too many other things. For example, the rear wing design and downforce has a big influence on what you do with the under-wing at the front of the car." Moreover, CFD analyses can be carried on while the car is being designed, long before any metal is cut or components assembled. One thing not done with ICEM CFD or the Raven solver is optimizing the design of the entire racecar. "That's because of the complexity and interactions of the design rules laid down by the sanctioning body*** for the races," Dr. Robinson noted. "Design optimization really only works when there are at most a handful of rules to accommodate, things like overall size or mass or simple volume constraints rather than exactly what it looks like and how it has to work. "Racing rules are very detailed," he explained, "very constraining on the design and, worst of all, very subjective. The vehicle shapes mandated by the rules are often too subjective for an optimization approach. Often the vehicle has to 'look' like the production vehicle upon which it was based. This is a difficult, if not impossible constraint to impose on an optimization tool. Optimization and verification possibly could be done on a wing, something that fits into a definable design envelope; but not for the whole car. The current state of the art doesn't allow for the removal of the human interaction from the design process. At least not yet. On the other hand, Dr. Robinson said that the ICEM CFD claim of "turning bricklayers into sculptors" is true at Aletheon. He adds: "Nobody else does the kind of design optimization and parametric studies that we do. They don't have the capabilities or staff expertise with modeling, gridding and solvers." CFD starts with an accurate CAD model and generating a discrete computational domain of points representing the geometry and the surrounding fluid. For each point, there is a set of partial differential equations to be solved. They represent the thermodynamic laws of conservation for mass, momentum and energy. The equations enforce the physical laws that state that mass, momentum, and energy cannot be created or destroyed. But they can be transported and exchanged for one another. At every point within the domain, there are state variables-density, pressure, the three components of velocity, and temperature-to which appropriate boundary conditions are applied. Because the solution is discrete, the accuracy of the result varies directly with the number of cells in the computation. Aletheon Technologies and its Aletheon Aero division, Mooresville, North Carolina, perform analyses for race car aerodynamics performance. Moreover, thanks to the extensive use of high-fidelity computational fluid dynamics (CFD) pre-processors, post-processors and solvers running on state of the art computer hardware, these aero performances meet or exceed targets required by Aletheon's race team customers. The entire initial development of these vehicles is done using a virtual design process. This approach entailed applying a state of the art CAD and CFD. An experimental approach may not be feasible during the initial design cycle. There may be no race vehicle to evaluate in a wind tunnel or on a track. Building such a test vehicle with its many iterations and suite of test parts may be too costly and slow. Moreover, with today's virtual design techniques, the initial prototype vehicle is much closer to an optimal design than previously. This compresses the race team's critical timeframe from prototype construction to first race. Also, by starting with a highly developed prototype, a large portion of the initial track/tunnel testing can be eliminated. This saves hundreds of thousands of dollars cam be saved in initial testing, not to mention running out of time. The computational approach to the aerodynamic analysis also provides a better understanding of the complete flowfield surrounding the vehicle. This leads to more intelligent wind tunnel/track testing, reduces the required number of test parts, and makes for a more productive and less costly development cycle. Moreover, virtual design with CFD and CAD can be undertaken in parallel with the building of the prototype vehicle, rather than waiting till it's built to start testing. This allows the race team to determine the vehicle competitiveness with others in its class prior to completing the vehicle. This also generates qualifying data required by the race's sanctioning body. The process begins with an accurate CAD and generating a CFD domain of the vehicle's geometry and the surrounding fluid volume, i.e., air. The resulting data includes the complete set of state variables (density, pressure, temperature, X/Y/Z velocity components) and a number of integrated aerodynamic values such as skin friction, forces, moments, etc. This is a huge amount of data and Aletheon offers it to customers in spreadsheets. Among many other things, the spreadsheets cover aerodynamic efficiency (the Lift to Drag ratio) and the percentage front/rear down-force, as well as the global force and moment values. Components include wheel flares, modified body work, rocker panels, cockpit, rear-wing, exhaust pipes, radiator duct work and a radiator flow-through. And because the analysis is still virtual, sanctioning body rules changes are easily accommodated. * In CFD terminology, "points" corresponds to what FEA users call degrees of freedom. CFD gridding corresponds to FEA meshing. The 30 million points accounts for the entire car. If yawing is not a factor in a given analysis, the car can be sliced lengthwise and model held to 15 million points. Most other Aletheon models are far smaller, in the range of 250,000 to 300,000 points. Aletheon models with a volumetric hexahedron, a brick or a pyramid, and integrates the solution around it. ** The business of CFD differs from that of FEA in an important respect. Processing and meshing tools come from one set of software vendors, among which long-time technology leader ICEM was a pioneer. Solvers come from other firms that typically rent them under six-figure annual license agreements. This is changing, however, as the early-2003 acquisition by of CFX (Waterloo, Ontario, Canada) by ANSYS indicates. *** The Sports Car Club of America (SCCA), Formula One Racing, CART and so on.